The school year is already in full swing, but it’s still fairly new. And for some people, it may be too soon to have fallen off the wagon. You know what I mean. To be behind by some measure. But someone might have. When I was doing mostly book work in school, by now I could be a little behind on readings/note taking. Nothing too serious. Just with that mentality that it’s still early, not too much pressing work. That’s the bad thinking that got me to this point at times. Being a tad behind, but it’s not serious because catching up won’t be difficult. Good thing about it is, it’s still so early in the year that the catch up game is a piece of cake at this point. It’s probably not even mid-semester, so there isn’t too much work yet. I’m all about being proactive. 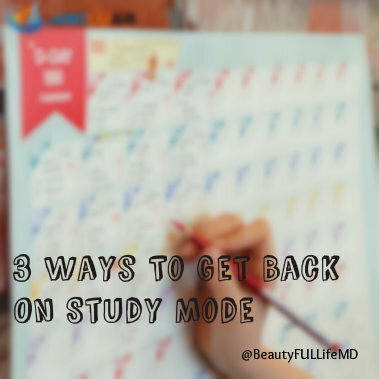 So in case you’re like me, and need to reset just a bit and catch yourself before you get too deep into being behind, here are 3 ways to get back into study mode. Make a plan. I can’t stress how important this is. Ok, maybe you already made a plan before and it didn’t do much for you. Good, go back to that plan and there you have everything you might have missed. Rework it to fit your new goals. If you didn’t have a plan before, make one now. Write it all down and workout a timeline. Goals without a timeline are just wishes. Batch your tasks to save time later. Maybe if spacing everything out doesn’t do it for you, it would be beneficial to group similar tasks and devote a sizable chunk of your time. For example, you can decide to take all of a Wednesday afternoon to complete worksheets, and answering questions. Or you can do all your note taking on a Saturday afternoon so you don’t have to take notes everyday the following week. It will already be done. Of course doing this method requires you to be committed to completing your tasks and being good at time estimation so you don’t run out of time. But if you get that down pat, you can save yourself a lot of time in the future. Sometimes it can be good to change things up when it comes to your study habits to help you get back on track. Get a study buddy. Probably one of the oldest tricks in the book. But it’s still good! And it can work. Find someone to play catch up with. You guys can keep each other motivated and hold each other accountable. You’re less likely to fall behind if you have someone to keep up with. Good luck studying. Keep going and don’t give up, even if you feel like you’re already behind. Know that you’re not the only one, and you still have a lot of time to make it a good semester. It’s only just begun!